Enrique Miguel Iglesias Preysler (born May 8, 1975 or 1976) is a Spanish pop singer-songwriter. He was born in Madrid. His parents are Spanish singer Julio Iglesias (born 1943) and Filipina journalist Isabel Preysler (born 1951). 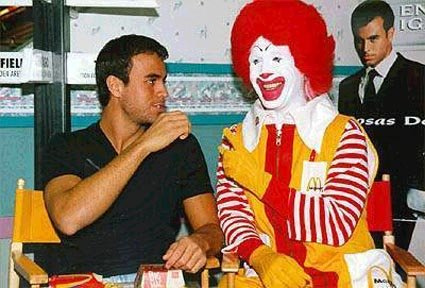 Iglesias with Ronald McDonald in 1999. His Cosas del Amor tour was sponsored by McDonald's. Enrique Iglesias Facts for Kids. Kiddle Encyclopedia.